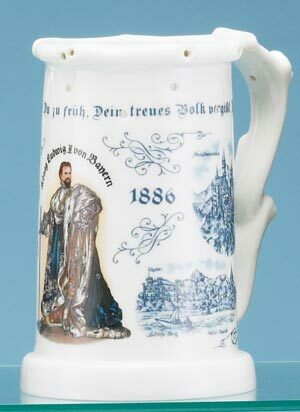 The body design features the most famous King of Bavaria surrounded by Bavarian blue images of the various castles that were credited to him. This design is applied to the traditional puzzle porcelain body in which numerous holes pass through the top half of the stein body and the along the lip rim and handle. There is only one special way in which to drink from this stein without spilling. First, hold the tankard with the left hand, then plug the hole that is underneath the handle with one finger. There is another hole inside the mug at the very base of the handle. The handle is actually hollow and functions as a straw. The liquid passes through the handle and to the first hole on the lip rim. Therefore, to perform the joke, the drinker needs to actually draw the drink through the hole rather than trying to pour the liquid all the way up to the mouth of the stein. An attractive finishing touch is a porcelain lithophane (see-through) bottom picture.